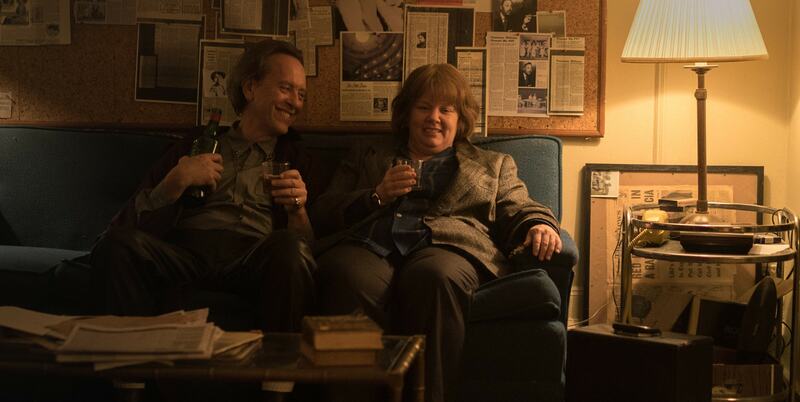 Aaron Neuwirth reviews the opening night film for the 2018 San Diego International Film Festival, Can You Ever Forgive Me? 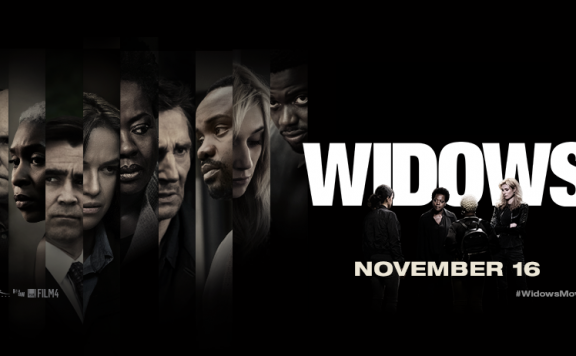 starring Melissa McCarthy. 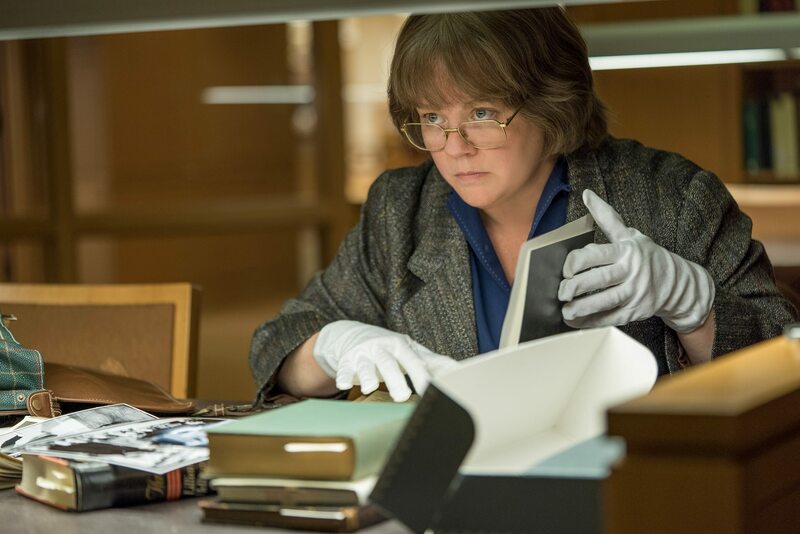 The 2018 San Diego International Film Festival opened with Can You Ever Forgive Me? This early 90s-set biopic features Melissa McCarthy as a misanthropic writer struggling to make ends meet, resorting to some criminal means to support herself and her cat. Thanks to a firm handle on tone and other creative choices by the filmmakers involved, the move works on a lot of levels. It is often funny, with a sense of wit to help keep you on board with such despondent characters. 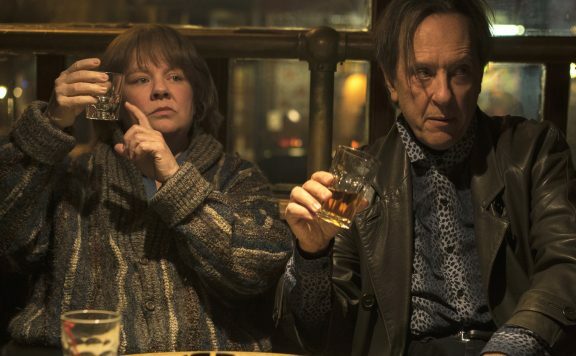 That in mind, the dramatic nature of the situation allows the film to reach an extra level when it comes time to acknowledge Can You Ever Forgive Me? for its compelling portrayal of loneliness and isolation. Based on the memoir by Lee Israel, McCarthy plays the character in a manner that most entertains me when it comes to her performances. For all the physical comedy and attempts to go broad in certain roles, the most I tend to enjoy McCarthy’s comedy is when she is shooting straight with a sarcastic wit. Not that putting people down always brings me joy, but there’s something about her profane nature when it comes to putting people in their place that is satisfying. For Lee, perhaps it has to do with why the character is like this. While the film doesn’t spend too much time on Lee’s life leading up to where the audience first meets her, you get a sense that she’s not the person she wanted to be and has decided to shut everyone out of her life as a result. So, when it comes to the way she uses her words to cut through people, it can also seem to serve as a way for her to size others up as far as whether she can allow them some way in. This is where the great Richard E. Grant comes in. As shabby layabout Jack Hock, Lee finds someone she can connect with in a way few others can experience. Together, the two drown their sorrows in alcohol, while barely managing to keep anything else together. Set in New York, the real push towards story surrounds Lee’s means of making enough money to pay the rent and various other bills. With no way to get her writing published, Lee finds herself in a position to forge and sell letters by deceased writers, playwrights, and actors. As an author with enough skill to impersonate the subject, Lee proves to be very capable of getting away with this act, at least for a while. 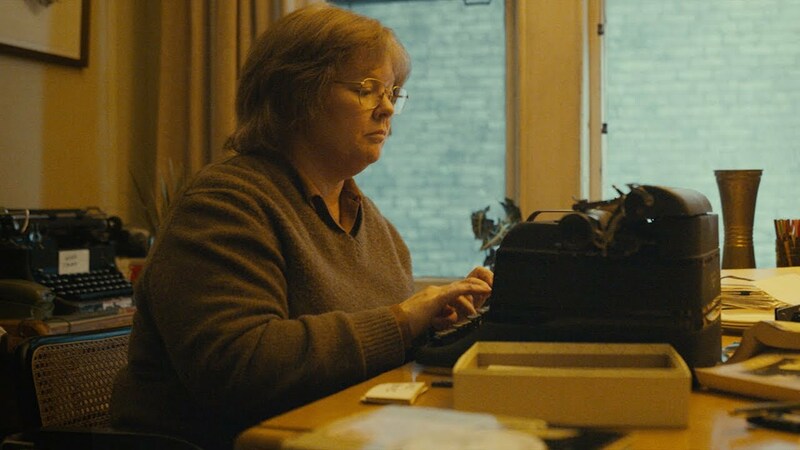 There is a sense of joy when it comes to seeing films about writers. Much in the same way I can get a kick out of seeing movies about the filmmaking industry, the thought of watching various actors playing lived-in versions of struggling (or occasionally successful) writers can be a lot of fun. 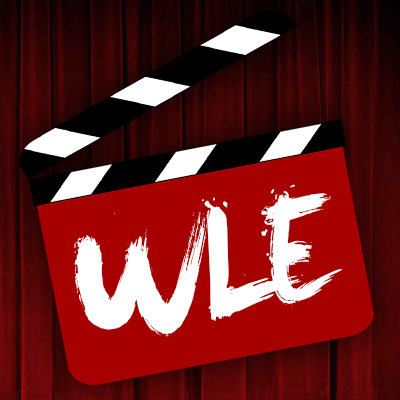 It allows films a chance to explore what’s behind the person attempting to shape the means of their life through a method they are uniquely gifted in. I suppose you could say that about a lot of professions, but making the life of a writer interesting can be an especially neat setup for those who also enjoy the writing process. Director Marielle Heller (The Diary of a Teenage Girl) understands this, as the film’s style leans heavily on how Lee has constructed her life and the world as she sees it. She has no real regard for looking kept, as we frequently watch her and Jack drink. Her apartment is a mess. The film is almost always set either in the dead of night, dawn, or dusk. This isn’t to say all writers live like this, but the film very much wants to capture an atmosphere that indicates the self-created anguish Lee is stuck with. 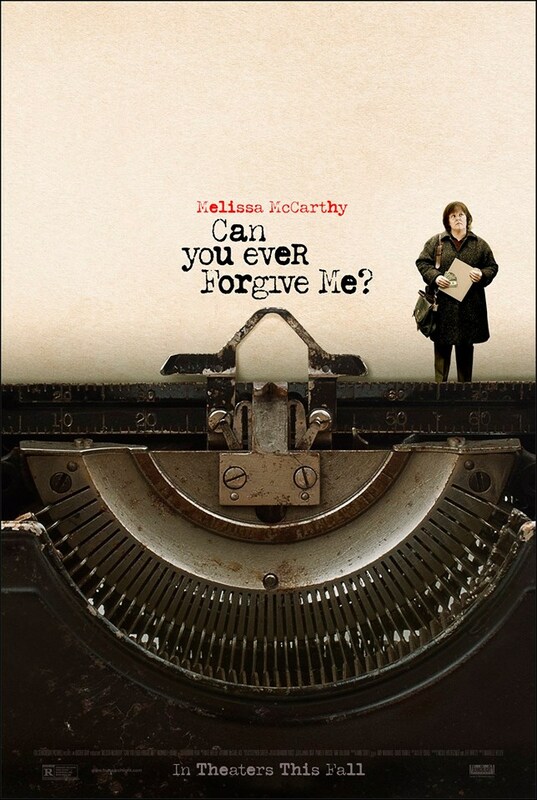 It’s amazing that Can You Ever Forgive Me? can be as funny as it is, given the bars and other grimy environments we are constantly sitting with Lee in. However, for all the laughs that come from either McCarthy’s differing takes on social etiquette or her wonderful chemistry with Grant, the script by Nicole Holofcener and Jeff Whitty does not shy away from some other simple truths – Lee is all alone and doesn’t know how to let others in. Whether or not the film needs any reason to tell us more about who Lee Israel is, I was a big fan of how the film used a sort of conman-based plotting element to push us further towards understanding her. As we watch her interact with various characters, whether its Jack or her exasperated agent Marjorie (Jane Curtain), or a friendly, but also lonely, bookshop owner (Dolly Wells), it is clear the film is showing us a person who has been hurt in various ways by life and has become used to hiding behind a shell of desolation to keep people at arm’s length. That may not be the most fun build-up to announcing this as McCarthy’s best performance, but it’s true. Watching the film put plenty of emphasis on her emotions via facial expressions in the many quiet moments of the film allows an audience to see so much. Her verbal interactions and the fun she has in selling the forged letters provide memorable and entertaining moments as well. Grant also rises to the challenge, stepping up for a performance not too far from being an older take on his breakout character in the 1987 black comedy Withnail and I. 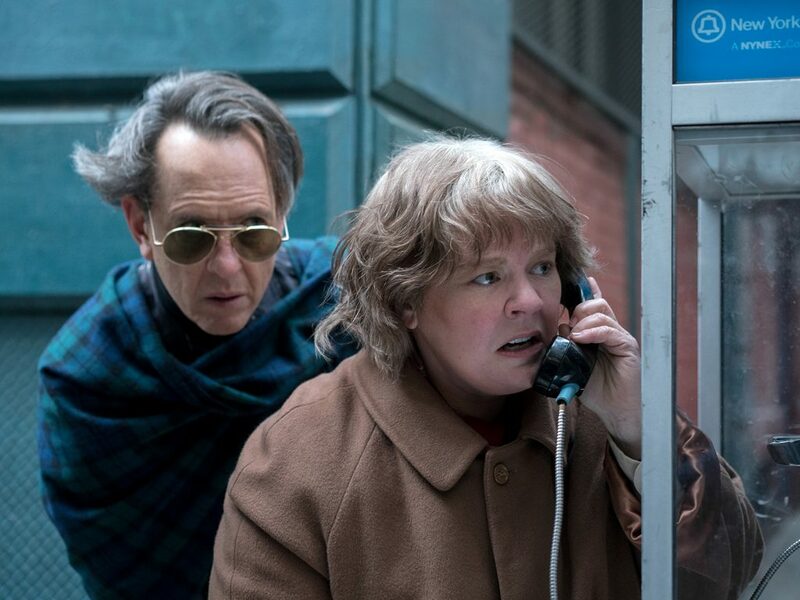 While the nature of recreating the actual events that occurred stands as good enough reason to want to watch Can You Ever Forgive Me? it really is a character showcase. Thanks to a story that is fitting enough for a solid linear narrative, it won’t be hard for an audience to dive into this comedy-drama and come out feeling rewarded by the excellent work by the actors to go along with a little dramatization of a strange bit of criminal history in Manhattan. It’s a well-crafted feature, with nary a typo to be found.